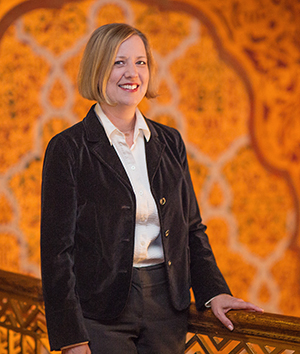 Becky Hancock has been appoint to National Historic Theater Board. Image courtesy of Tennessee Theatre. KNOXVILLE — Tennessee Theatre Executive Director Becky Hancock has been appointed to the board of directors of the League of Historic American Theatres (LHAT) at its annual conference in Nashville. LHAT was founded in 1976 and is the nation’s foremost national association of historic theaters, opera houses and movie palaces. It has more than 300 historic venues represented across the country from grand Broadway theaters in New York to small town theaters on Main Street. Hancock will begin serving a three-year term on the board in January 2016 with a renewal option for an additional three years. Current board members nominate and vote on the selection. Hancock’s appointment was confirmed with a ratifying membership vote at the organization’s annual conference last week. Hancock has been an active member of LHAT since 2003 while serving as general manager of the Tennessee Theatre during the theater’s restoration. The prestigious LHAT board of directors includes leadership from such industry giants as Disney Theatrical Group, Americans for the Arts, The Shubert Organization and the Nederlander Producing Company. The board also includes representation from two companies that were instrumental in the 2005 restoration of the Tennessee Theatre. Westlake Reed Leskosky, Cleveland-based architecture firm specializing in historic theaters, were consulting architects on the project, and Plymouth Soundings, LLC, based in Loudon, Tenn., served as a project coordinator.